Our home is in south-east Ohio, in Guernsey County. We're about 80 miles east of Columbus and have lived on what we like to call our "micro-mini farm" since 1988. I have had a life-long love of animals and have worked as a veterinary assisitant for a small animal clinic. We had bred and shown miniature horses for about 10 years prior to getting goats. 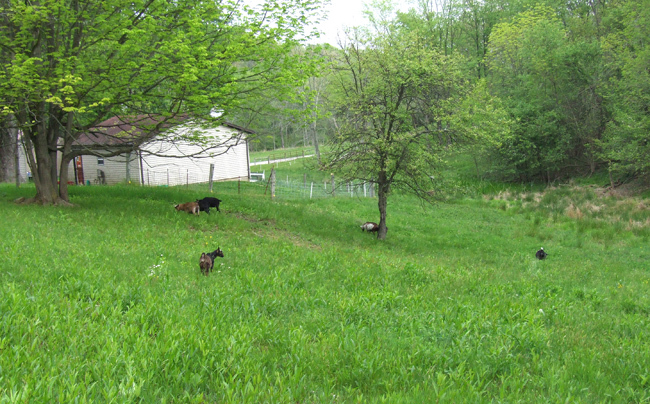 My interest in goats came from our property being more suited for goats than for horses as we have lots of browse and not so much pasture. I was introduced to Boer goats in 2005 as some of my friends had them. We had planned to raise some for our freezer but I'm 'one of those people' that happens to get very attached to my animals and after seeing the kids born, interacting with them, and raising them into adulthood, I couldn't bring myself to butcher my own goats. Most kids went for 4H projects which was great! With times getting hard and hay becoming so expensive, it became impractical to try and feed a small herd of Boers and expect to make anything back. During my (never-ending) study of goat health and husbandry, I found out about Nigerian Dwarf dairy goats. I visited many websites and visited one farm where I fell in love with his breed but I put off making any purchases until 2008 when we visited several more farms and spoke to breeders. By then I was completely smitten and made several purchases from Sue Rucker at Buttin'Heads, and Cindy Dahl at Wild Wind Farm. We started off with 5 does, 3 bucks, and a wether (he was a companion for another). We really love the dairy goats and will keep our herd small, focusing on healthy, physically sound, disease free, quality milking animals. We do show our goats at some ADGA shows and it's helping to direct us in building a good base herd. We also plan to use Linear Appraisal as another herd improvement tool. We started milking our girls for our own personal use and the milk is absolutely fantastic! Store-bought milk can't even compare. Besides milking, I have found that I thoroughly enjoy making cheese out of our fresh milk. Oh what I've been missing!! One of life's simple, yet great pleasures for sure. We test for CAE annually and our recent investment of a college lab quality microscope will allow us to better control parasites and spare the goats from over- (and especially under) medicating. We're also have an interest in "mini-milkers" which are crosses of Nigerian Dwarf bucks and standard size dairy does although we don't have any at this time. This will produce a small-to-medium size animal that is very feed and cost efficient but that still produces decent quantities of rich milk for the small homesteader. I enjoy meeting other people with an interest in dairy goats, especially the Nigerian Dwarves.